Quarry Safety courses 2 Saturdays per month. Contact Clive Kelly on 087 2196988 for more information. This is not a public course. Group bookings only. Venue is the clients’ site and clients equipment is used. In 2018 the Health and Safety Authority are running a safety campaign in Blockyards throughout Ireland. 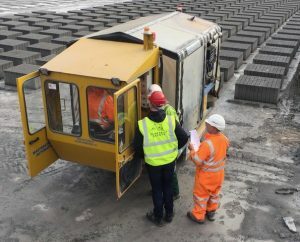 In preparation for this safety campaign, Clive Kelly Safety offers to carry out Safety Audits and deliver Block machine and Strapper safety courses to customers. In addition top these courses, Clive Kelly can offer Manual Handling, Truck Mounted Crane and Forklift Training to Blockyards. These are not a public courses. Group bookings only. Venue is the clients’ site and clients equipment is used. Clive Kelly Safety Limited offers MEWP (Cherry Picker) and Working at Heights training to clients anywhere between Dublin to Clare all across the middle of the country towards Waterford. This includes Dublin, Laois, Kilkenny, Carllow, Waterford, Cork,Tipperary, Athlone, Kildare,Limerick, Clare etc. These courses take place at the clients’ premises using the clients equipment. This has the advantage of ensuring that participants use equipment that they are familiar with and which is an integral part of their day-to-day work.